Madi Montenaro of FHS rips a base hit against Springfield Catholic Central during Monday’s FHS triumph. Madi Montenaro had a big day at the plate on Monday as Fairbanks’ softball squad clubbed Springfield Catholic Central, 15-5. The senior went four-for-five at bat, with a pair of doubles and a triple. She also drove in two runs. 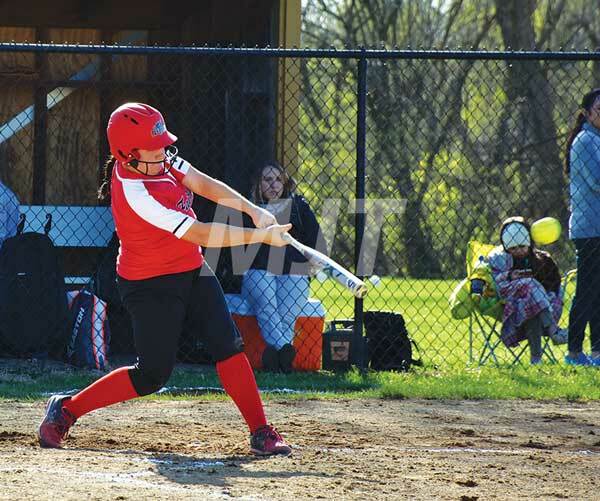 Riley Blevins and Bella Rowland weren’t that far behind as the Lady Panthers (6-9 overall and 3-6 in the Ohio Heritage Conference) rapped 16 hits. Blevins and Rowland each had three hits. Allison Kise and Anna Higbee each added two. The Lady Panthers’ offensive outburst supported winning pitcher Julia Cheney. She fanned six, walked one and yielded four hits during four innings in the circle. April Ward pitched the final three frames. The Lady Panthers will host Cedarville today. The FHS baseball squad made short work of Springfield Catholic Central with an 11-0 victory in 5 ½ innings. Braxton Wilhelm allowed just one hit and struck out five for the complete-game triumph. The Panthers (8-4) tallied 11 hits. Alex Jones led with three hits, while Jaeden Eickhoff and Weston Lorenz each had two. Also hitting safely were Grant Rausch, Hayden Hoover, Connor Pack and Wilhelm. Wilhelm drove in three runs. The Panthers will host Cedarville today. Triad’s softball squad needed just six innings to pummel Cedarville, 14-0. Kendell Hughes went four-for-four at the plate. Bri Easton had three hits and Joni Russell added two. Russell was the winning pitcher. Sydney Louck pitched in relief. Triad (8-4 overall and 6-2 in the OHC) will host Greeneview today.